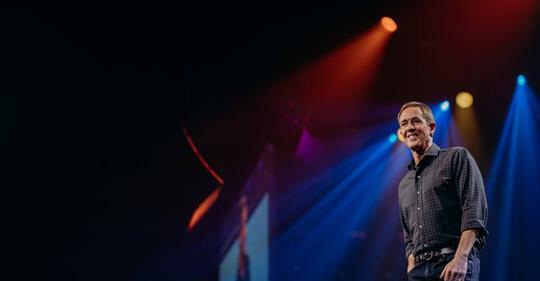 Faithwire is reporting the story this week, but Andy Stanley preached the sermon in which he is reported to have said that the Ten Commandments don’t apply to Christians anymore" in May 2018, and much of the Christian community took him to task for it, and rightly so. Wesley Hill, of Trinity School for Ministry, wrote an excellent critique in First Things. The Christian Post jumped on the story too: But then they published an opposing opinion two weeks later. My take on this when it first arose (and still is) that we are witnessing a dangerous trend among some popular evangelical preachers to jettison "unpopular" parts of Christianity. They think that by doing it they are appealing to seekers and preserving their ability to evangelize them. But in reality they are preaching poor theology, misconceptions, and half truths about the nature of the Bible and the Gospel, and no one can make genuine Christ-followers by doing that. "Therefore no one will be declared righteous in God's sight by the works of the law; rather, through the law we become conscious of our sin" (Romans 3:20). "Yet we know that a person is not justified by works of the law but through faith in Jesus Christ, so we also have believed in Christ Jesus, in order to be justified by faith in Christ and not by works of the law, because by works of the law no one will be justified" (Galatians 2:16). "Clearly no one who relies on the law is justified before God, because 'the righteous will live by faith'" (Galatians 3:11). But notice the line Paul quotes in Gal. 3:11, "the righteous will live by faith." It is a quotation from Habakkuk 2:4. Ah, so the Old Testament teaches salvation by faith also! But is the Law—specifically the Ten Commandments, which Andy Stanley mentions in his sermon—is the Law abrogated or abolished in the New Testament? The Law frequently appears in the teaching of Jesus. In the Sermon on the Mount he refers very specifically to it: "Think not that I came to destroy the law or the prophets" (Matthew 5:17). Here the term would seem to mean the whole of the Pentateuch: "I came not to destroy, but to fulfill. For truly I say to you, till heaven and earth pass away, one jot or one tittle shall in no wise pass away from the law, till all things be accomplished" (Matthew 5:17,18). What Jesus really does is to bring out the fullness of meaning that is in the Law, and he declares that the righteousness of his disciples must exceed the righteousness of the scribes and Pharisees (Matthew 5:20). The righteousness of the Pharisees consisted largely in a punctilious observance of the external requirements of the Law; but Jesus' disciples must yield their hearts and their obedience to the inner spirit of the Law. Matthew 5:21-22, “You have heard that it was said 'You shall not murder..." But I say to you that everyone who is angry with his brother will be liable to judgment; whoever insults his brother will be liable to the council; and whoever says, ‘You fool!’ will be liable to the hell of fire." Matthew 5:27-28, “You have heard that it was said, ‘You shall not commit adultery.’ But I say to you that everyone who looks at a woman with lustful intent has already committed adultery with her in his heart." Matthew 5:31-32, “It was also said, ‘Whoever divorces his wife, let him give her a certificate of divorce.’ But I say to you that everyone who divorces his wife, except on the ground of sexual immorality, makes her commit adultery, and whoever marries a divorced woman commits adultery." Matthew 5:33-34, “Again you have heard that it was said to those of old, ‘You shall not swear falsely, but shall perform to the Lord what you have sworn.’ But I say to you, Do not take an oath at all..."
Matthew 5:38-39, “You have heard that it was said, ‘An eye for an eye and a tooth for a tooth.’ But I say to you, Do not resist the one who is evil. But if anyone slaps you on the right cheek, turn to him the other also." Matthew 5:43-44 “You have heard that it was said, ‘You shall love your neighbor and hate your enemy.’ But I say to you, Love your enemies and pray for those who persecute you..."
Does any of this sound like Jesus is abolishing the Law? No. Jesus said, "Do not think that I have come to abolish the Law or the Prophets; I have not come to abolish them but to fulfill them" (Matthew 5:17). So how did Jesus fulfill the Law? Jesus fulfilled the Law and the prophets in his birth, ministry, death and resurrection. He fulfilled the moral law by obeying it and by bringing out its true spiritual significance. And he established it on a surer basis than ever as the eternal law of righteousness. Jesus fulfilled the ceremonial law, not only by conforming to its requirements, but by fulfilling it with his offering of himself as the once-for-all sacrifice for sin, so that it is no longer necessary for us to observe the Passover or repeat the daily Temple sacrifices. But the moral law, epitomized in the Ten Commandments, remains as a reminder of the righteousness that God requires; and, thanks to the teaching of Jesus, we know that it is binding, not only on our outward actions, but on the attitudes of our hearts. Now all of what I have just said, Andy Stanley could have learned if he paid attention in seminary, or read the right books, or even read a good article in a theological dictionary. But this points to the real danger I am seeing in a lot of contemporary Christianity: the emphasis is more on salesmanship than it is on faithfully and accurately representing the product. But the seriousness of this becomes clear when we realize that the Gospel is a message of words; it consists of teaching. So when we fail to faithfully and accurately represent the product, we actually change the product. And, to use an analogy from Chemistry, if instead of our words being sodium chloride (salt) which the Bible tells us they are supposed to be, they become potassium chloride which, in sufficient amounts, is the substance that stops the heart in a lethal injection! And the theological shallowness of the entertainment culture that is influencing the contemporary Church is spiritually just as lethal.